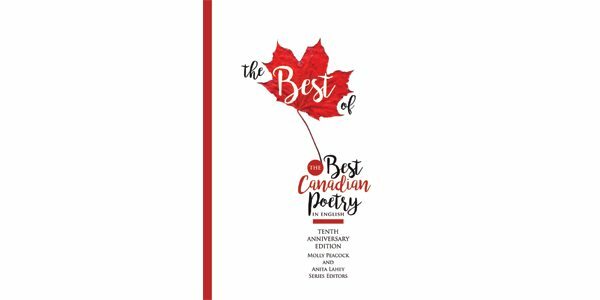 The 10th anniversary edition of Tightrope Books’ Best Canadian Poetry in English anthology series compiles 90 poems from previous years to come up with a so-called “best of the best” selection. The new volume opens with introductory essays from series editors Molly Peacock and Anita Lahey, and closes with contributor commentaries and biographies, highlights from the introductions by the first nine guest editors, and an index cross-referenced by subject and form. The first poem in the new volume is Margaret Avison’s “Two Whoms or I’m in Two Minds,” and includes entries from all the expected heavyweights: Jan Zwicky, Carmine Starnino, Jeramy Dodds, Steven Heighton, and Evelyn Lau, among others. Jumping off from Avison’s title and subject, Peacock posits an organizing principle for this best-of anthology – the “notion of two-minds-inside-one-consciousness” that “seems to operate across the aesthetic landscape of Canadian poetry, from conservative to experimental styles, from locales in Newfoundland to British Columbia.” Peacock goes on to suggest that the “two minds, the witness and the actor, the self and the counterpoint of another, serve to create twin approaches to single events.” This dual consciousness is evident in many of the poems collected here, and raises questions about conflicting claims that Canadian poetry is more predominantly “a leading eco-poetry” or a “meditation that leads to awe.” Why must the prevailing characteristic of Canadian poetry find its trace in the Romantic ideas of awe and the sublime instead of a contemporary poetics that has come to articulate the double consciousness experienced by many marginalized people? Lahey’s essay is instructive in this regard. Lahey, who served as the editor of Arc Poetry Magazine for eight years, is cognizant of her own role as a privileged gatekeeper, and of the necessity of considering various histories and politics when reading and evaluating poems. Lahey quotes from Alicia Elliott’s essay, “On Seeing and Being Seen,” published earlier this year in Room magazine: “I scraped all indigeneity out of my work. At least if my fiction read as ‘white’ I’d be sure that any rejections were based on the work itself.” Elliott’s hesitation underscores the dual consciousness that Peacock identifies at work in much Canadian poetry today. Despite Peacock’s assertion that the focus on split consciousness cuts across various techniques in Canadian poetry, the majority of entries in this collection cleave to a kind of straightforward lyricism. What does it mean, in this regard, to exclude poets such as the 2017 Griffin Poetry Prize winner Jordan Abel, who also appeared in the 2014 volume of Best Canadian Poetry? In addition to exemplifying the split consciousness of the Indigenous poet, Abel writes in a defiantly anti-lyrical mode. Though techniques like found poetry, erasure poetry, and visual poetry inform certain entries in The Best of the Best Canadian Poetry, many of the poems in this compilation exhibit an unmistakable lyricism on their surface. Is this preference simply a matter of taste on the part of the volume’s editors? The 2014 edition of the anthology was guest edited by Sonnet L’Abbé, who included Abel alongside Nicole Brossard, Adam Dickinson, Moez Surani, and Kevin Spenst. The 2011 edition, guest edited by Priscila Uppal, included poets such as Jonathan Ball, Susan Holbrook, and Derek Beaulieu. Unlike the current “best of” version, these editions of the annual anthology did not share a largely homogenous, lyric approach. By contrast, many of the poems in this volume are plainspoken and told from a first-person point of view. The issue isn’t that the selections in The Best of the Best Canadian Poetry are lyric poems, but that the sensibilities of Peacock and Lahey have conflated diverse voices and techniques to such an extent that a lyric quality is almost the default setting. Contributor commentaries and samples of guest-editor statements speak of processes that may not be lyric per se. However, the fact that many of the poems in The Best of the Best Canadian Poetry adhere to this mode implies a yearning, at least on Peacock and Lahey’s part, for some sort of common language. Based on their selections here, that language is typically cast in one predominant style. Correction: The print version of this review erroneously attributed a rhetorical question on the part of the reviewer (at the end of the second paragraph) to one of the editors of this anthology. Q&Q regrets the error.